This webpage is about the North American terrestrial land snail Appalachina chilhoweensis (J. Lewis, 1870), or more commonly know as the Queen Crater Snail. The purpose of this webpage is to educate people about A. chilhoweensis and to add information to the larger web projects at http://MultipleOrganisms.net and http://www.uwlax.edu/biology/faculty/perez/Perez/PerezLab/Research/WIsnailslist.htm headed by the University of Wisconsin-Lacrosse Biology Department. Appalachina chilhoweensis is the largest land snails in the Great Smoky Mountain region. 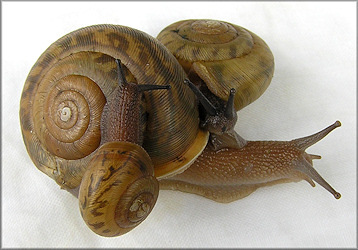 These snails are found in Kentucky, Tennessee and North Carolina. A. chilhoweensis was originally placed with the genus Mesodon, but after genital dissection, A. chilhoweensis was positioned within the genus Appalachina.